Je vous souhaite un excellent Wednesday! Absolutely loving your print skirt! Bellissimo questo look anni '70! 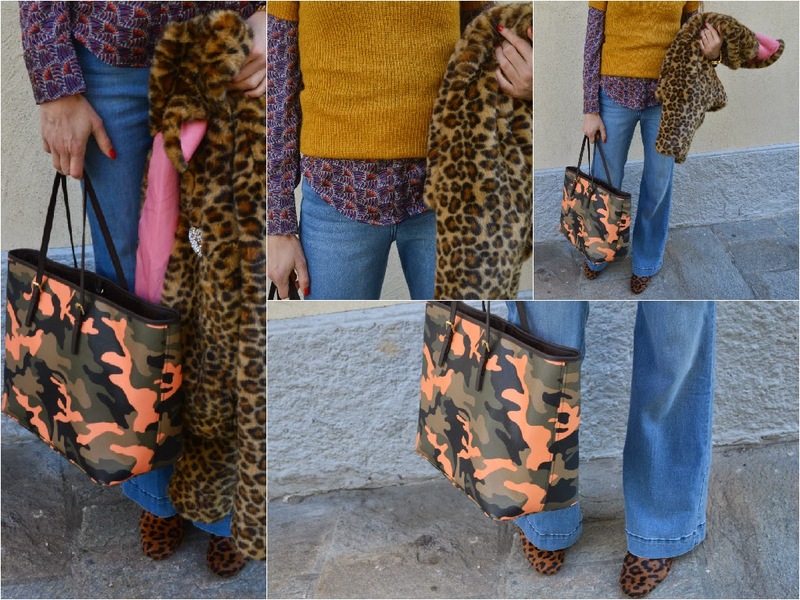 I jeans a zampa sono favolosi, così come i dettagli animalier!! Love the outfit! The color of your sweater is just too amazing! C'est vraiment fun et audacieux Jeanne, bravo pour ton imagination et ta créativité ! gorgeous outfit honey! cool post. Love how you mixed the look! You look great, I love your mix of colours and prints! Those jeans fit you perfectly! Great way to style them! J'adore ton jean, trop beau ! These jeans are fabulous and perfect on you! Stai molto bene e mi piace la borsa!! Nice outfit, I like the colouring. I have been thinking of when the flares were going to be back in fashion, looks like we are heading there! You look amazing!!! Love your cute 70's vibe :) ! Thanks for visiting my blog and your comment! you have such a cool style! lovely photos! Mi piace molto questo modello di jeans e a te sta benissimo anche perche hai delle gambe perfette. Very cool! I liked the way you styled these. amazing combination, love the pop of colours. gREAT POST AS USUAL. You look incredible. I love your leopard coat. I love these pair of jeans! Those jeans are fab on you sweety! Beauty! Love this mix and match! Very cool this look! I like that you think outside the box and rock it beautifully. Love the look! I like how you mix the colors and prints. love this hippie style on you and those jeanse are perfect! Mixing prints is fun and definitely on trend! I love the colour of your sweater and the way you styled it with a blouse! loving the flared pants! I need new ones! Anche io devo comprarmi i jeans a zampa, ci stai troppo dentro (come direbbero i ccciovani), fighissima la camicetta! Ohhh I love your coat Jeanne, so cool! Such a cute outfit, I love the colours and your amazing layering! Beautiful! And I love your hairstyle, very pretty! Like a moviestar/model!! & Thankyou for the positive feedback on my blog!! Cette tenue fait très années 70 ;) C'est super ! I still love your camo bag! The flares are nice too! Lovely combination, you look great in these jeans!! Love the jeans. The top is so sophisticated, but you totally nailed it. I think I found a bag similar to yours in an online retail fashion accessories shop. Hai creato uno splendido look anni 70! Buon venerdí Jeanne! Ahh! I haven't worn flared jeans in a loooooong time! You look fabulous in them! Che bella questa felpa Elisa! Sei stupenda! La veste est très sympa également !